The UTX ESF is a lightweight long leg brace (also called KAFO, orthosis, or splint) and extension of the UTX line. Sometimes the ankle foot region needs more control. This can be the case, for example, if there are anatomical deformities around the foot or ankle. A custom made Ankle Foot Orthosis (AFO) will then be better able to provide good fit with the desired correction and support. Also, the load line on the leg with an AFO can be more affected. For example, a serious knee over stretching can be better managed if we start from the ankle to keep the working line of the loading on the leg line as close as possible to the knee, which means that the AFO should ensure that the lower leg in the ankle can not lean too far back. For those situations, the UTX ESF has been developed. This orthosis combines a lightweight UTX frame with an individually custom-made Ankle Foot Orthosis (EVO) to ensure optimal control over both the ankle and the knee. 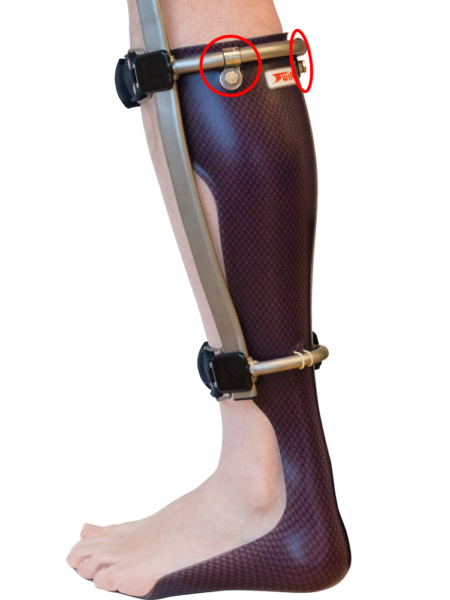 ESF is an abbreviation of AFO (in Dutch EVO)-STABIL-FREE, which refers to the construction of this leg brace: the integration of an UTX STABIL or an UTX FREE with a custom-made AFO. The UTX SWING is intended for people who suffer from reduced control over the quadriceps and, consequently, can no longer walk safely and stably. If, in addition, control over the stability of the hip has been affected, it is sometimes necessary to choose to fully lock the leg while walking, to remain safe standing and walking. Although we like to let you walk dynamically at Ambroise, it must be safe. For example, if it does not work with, for example, an UTX SWING we will use the UTX STABIL to realize a safe way of walking. Als daarnaast ook extra controle en opvang rond de enkel en voet nodig zijn, bv ten gevolge van spasticiteitsklachten, dan gebruiken we de UTX ESF STABIL. For people who, besides reduced control over the quadriceps, also suffer from a valgus or varus instability of the knee, the ESF STABIL can also be performed as a UTX FS worden uitgevoerd. If you still have good control over the hip muscles, then the UTX SWING may be a better solution for you. The SWING can also be integrated with a customized AFVO. That variant is called the UTX ESC. Our clinical experts are happy to work with you to assess which variant best suits your situation. How does the UTX ESF work? The UTX ESF is used as STABIL or as FREE. In the first case, the knee hinge is locked for maximum stability during the entire walking cycle. Manually unlocking is possible using the button on top of the orthosis. See the UTX STABIL page for more details. In the second case (version as FREE) the knee can bend freely throughout the entire walking cycle. The UTX knee hinge provides protection against over streching the knee. The extension stop in the knee hinge prevents hyperextension. The custom-made AFO is attached to the UTX frame. The designed coupling makes it possible to adjust the AFO and foot position accurately during the fitting phase. For some people, that is important. A little bit more external rotation (turning the foot out ward) or even endorotation (turning inwards) can make a big difference in the feeling of stability and ease of footrolling.